A dental implant is the latest technology in dentistry and the the best way to replace a missing tooth! It is a combination of a titanium implant which is inserted into the bone where the tooth used to be and a crown which is made from porcelain to closely match the surrounding teeth. 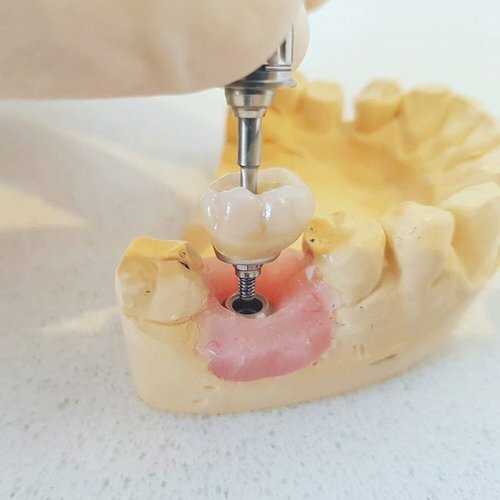 The placement of the implant although it may sound daunting is quite a controlled and comfortable procedure, it is all completed in the chair with local anaesthetic. Once the implant is placed you may have some tenderness in the area for a few days while the implant heals. It takes 6-8 weeks usually for an implant to fully integrate with the bone. During the healing process we can construct a temporary tooth to be put in the space in a number of ways. This is especially helpful if the missing tooth is in a highly aesthetic area. Once the healing process is complete the surgeon will test the titanium implant to confirm it is healed and fully integrated with the bone. Then we take impressions (moulds) to begin construction of a porcelain tooth (crown) to sit upon the titanium implant in the bone. Once constructed we connect the two together in your mouth, restoring your smile with a tooth that is virtually indistinguishable from a natural tooth and also restoring your bite.